See Ezra UPDATE as of February 7, 2014. 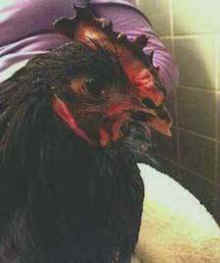 And another update from late March - Ezra The Rooster: The Little Chicken Who Could! 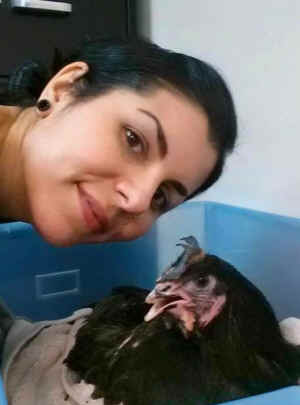 Nothing could have prepared me for the series of texts and emails I received last night describing a ritual “offering” of a live rooster who was found with his legs tied very tightly together and placed at a headstone in a cemetery. Tied to his legs was a baby doll, ribbons and a piece of fatty, raw meat. Apparently, someone visiting a deceased relative reported seeing him alive on Christmas Eve and called police. But upon returning New Year’s Eve found him still there, so he languished in the cold without food or water for at least a week or more through these record winter storms. Whoever did this intended for him to die a slow and painful death from starvation, dehydration, hypothermia or predator attack. Today he’ll be seeing a vet to assess what his prospects are, which don’t look very good. He has severe frostbite in his extremities and his feet are black, which may indicate gangrene or severe frostbite. We assume he was the victim of some form of ritual religious sacrifice. Ezra's doing great. Here he is pictured with his primary caretaker, Melissa Summer Pena. His sutures from the surgery were removed and he has fully healed. He still needs a lot of special care. We're also exploring the best options for him for his long term mobility. We're consulting with people who have dealt with similar cases of birds whose legs had been amputated due to frostbite and/or gangrene.